Carnegie Mellon University (CMU) is a private research university based in Pittsburgh, Pennsylvania. Founded in 1900 by Andrew Carnegie as the Carnegie Technical Schools, the university became the Carnegie Institute of Technology in 1912 and began granting four-year degrees. In 1967, the Carnegie Institute of Technology merged with the Mellon Institute of Industrial Research to form Carnegie Mellon University. With its main campus located 3 miles (5 km) from Downtown Pittsburgh, Carnegie Mellon has grown into an international university with over a dozen degree-granting locations in six continents, including campuses in Qatar and Silicon Valley, and more than 20 research partnerships. The university has seven colleges and independent schools which all offer interdisciplinary programs: the College of Engineering, College of Fine Arts, Dietrich College of Humanities and Social Sciences, Mellon College of Science, Tepper School of Business, H. John Heinz III College of Information Systems and Public Policy, and the School of Computer Science. Carnegie Mellon counts 13,961 students from 109 countries, over 105,000 living alumni, and over 5,000 faculty and staff. Past and present faculty and alumni include 20 Nobel Prize laureates, 13 Turing Award winners, 23 Members of the American Academy of Arts and Sciences, 22 Fellows of the American Association for the Advancement of Science, 79 Members of the National Academies, 124 Emmy Award winners, 47 Tony Award laureates, and 10 Academy Award winners. The Carnegie Technical Schools were founded in 1900 in Pittsburgh by the Scottish American industrialist and philanthropist Andrew Carnegie, who wrote the time-honored words "My heart is in the work", when he donated the funds to create the institution. 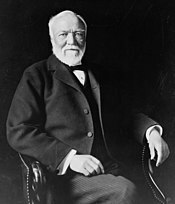 Carnegie's vision was to open a vocational training school for the sons and daughters of working-class Pittsburghers (many of whom worked in his mills). Carnegie was inspired for the design of his school by the Pratt Institute in Brooklyn, New York founded by industrialist Charles Pratt in 1887. In 1912, the institution changed its name to Carnegie Institute of Technology (CIT) and began offering four-year degrees. During this time, CIT consisted of four constituent schools: the School of Fine and Applied Arts, the School of Apprentices and Journeymen, the School of Science and Technology, and the Margaret Morrison Carnegie School for Women. The Mellon Institute of Industrial Research was founded in 1913 by a banker and industrialist brothers Andrew (who went on to become Treasury Secretary) and Richard B. Mellon in honor of their father, Thomas Mellon, the patriarch of the Mellon family. The Institute began as a research organization which performed work for government and industry on a contract and was initially established as a department within the University of Pittsburgh. In 1927, the Mellon Institute incorporated as an independent nonprofit. In 1938, the Mellon Institute's iconic building was completed and it moved to its new, and current, location on Fifth Avenue. 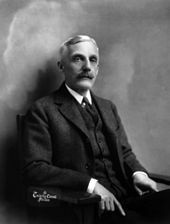 The industrial research mission of the Mellon Institute survived the merger as the Carnegie Mellon Research Institute (CMRI) and continued doing work on contract to industry and government. CMRI closed in 2001 and its programs were subsumed by other parts of the university or spun off into autonomous entities. Carnegie Mellon's 140-acre (57 ha) main campus is three miles (5 km) from downtown Pittsburgh, between Schenley Park and the Squirrel Hill, Shadyside, and Oakland neighborhoods. Carnegie Mellon is bordered to the west by the campus of the University of Pittsburgh. Carnegie Mellon owns 81 buildings in the Oakland and Squirrel Hill neighborhoods of Pittsburgh. In 2006, Carnegie Mellon Trustee Jill Gansman Kraus donated the 80-foot (24 m)-tall sculpture Walking to the Sky, which was placed on the lawn facing Forbes Ave between the Cohon University Center and Warner Hall. The sculpture was controversial for its placement, the general lack of input that the campus community had, and its (lack of) aesthetic appeal. In April 2015, Carnegie Mellon University, in collaboration with Jones Lang LaSalle, announced the planning of a second office space structure, alongside the Robert Mehrabian Collaborative Innovation Center, an upscale and full-service hotel, and retail and dining development along Forbes Avenue. This complex will connect to the Tepper Quadrangle, the Heinz College, the Tata Consultancy Services Building, and the Gates-Hillman Center to create an innovation corridor on the university campus. The effort is intended to continue to attract major corporate partnerships to create opportunities for research, teaching, and employment with students and faculty. The campus began to take shape in the Beaux-Arts architecture style of Henry Hornbostel, a winner of the 1904 competition to design the original institution and later the founder of what is now the Carnegie Mellon School of Architecture. During the 1970s and 1980s, the tenure of University President Richard Cyert (1972–1990) witnessed a period of growth and development. The research budget grew from roughly US$12 million annually in the early 1970s to more than US$110 million in the late 1980s. 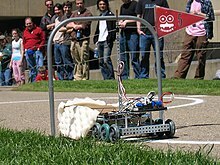 The work of researchers in new fields like robotics and software engineering helped the university to build on its reputation. One example of this approach was the introduction of the university's "Andrew" computing network in the mid-1980s. This pioneering project, which linked all computers and workstations on campus, set the standard for educational computing and established Carnegie Mellon as a leader in the use of technology in education and research. On April 24, 1984, cmu.edu, Carnegie Mellon's Internet domain became one of the first six .edu domain names. New York's Mayor Michael R. Bloomberg, and New York University's President John Sexton on April 23, 2012, announced an agreement between New York City, New York's MTA, and a consortium of academic institutions, and private technology companies, that will lead to the creation in New York of a Center for Urban Science and Progress (CUSP). The Center for Urban Science and Progress (CUSP) is an applied science research institute which will be a partnership of institutions from around the globe, led by New York University with a consortium of universities including the University of Warwick, Carnegie Mellon University, the City University of New York, the Indian Institute of Technology Bombay, and the University of Toronto. On February 5, 2013, Carnegie Mellon announced the selection of Subra Suresh, Director of the National Science Foundation and Dean of the Massachusetts Institute of Technology School of Engineering, as its ninth president effective July 1, 2013. Suresh stepped down in June 2017 and was replaced by Farnam Jahanian, the university's interim-president and former provost, in March 2018. For the Class of 2022, Carnegie Mellon had an overall admissions rate of 17%. The acceptance rates of the individual colleges vary, ranging from the less selective Dietrich College of Humanities and Social Sciences (14%) to the more selective School of Computer Science (5%). The average high school grade point average (GPA) of the enrolled freshmen was 3.76, while the middle 50% range of SAT scores were 660-750 for critical reading, 720-800 for math, and 670-760 for writing. The middle 50% range of the ACT Composite score was 31-34. The largest college, in terms of enrollment in the class of 2021, is the College of Engineering with 434 students, followed by the Dietrich College of Humanities & Social Sciences with 303, and the Mellon College of Science with 281. The smallest college in terms of total undergraduate enrollment is the Tepper School of Business, with 57. Carnegie Mellon enrolls students from all 50 states and the District of Columbia, and 15.6% of the students are citizens of countries other than the United States, representing more than 40 countries. Undergraduate tuition is $54,244 and room and board is $14,418 on average plus additional costs. Carnegie Mellon graduates 62% of its undergraduate students in science, technology, engineering, and mathematics fields, the 13th highest percentage in the United States amongst national research universities. Globally in 2017–2018, Carnegie Mellon University was ranked 77th by U.S. News & World Report, 80th by ARWU, 24th by Times Higher Education and 47th by QS World University Rankings. Nationally, U.S. News & World Report ranks Carnegie Mellon tied for 25th among American research universities in 2019. U.S. News also ranked Carnegie Mellon 1st for graduate studies in computer science, tied for 4th for graduate studies in engineering, 6th for graduate studies in fine arts, 14th for graduate studies in public affairs, 8th for graduate studies in statistics, 20th for graduate studies in economics, 17th for graduate studies in business, and 17th for graduate studies in psychology in 2016. The undergraduate business program is ranked 2nd for management information systems, 2nd for production/operations and quantitative analysis, 8th for supply chain management, and tied for 6th as an undergraduate business program overall. The undergraduate engineering program at colleges that offer doctorates as the highest degree was ranked tied for 8th overall, 1st for computer engineering, 9th for environmental engineering, and 11th for mechanical, electrical, and civil engineering in 2017. Carnegie Mellon was named one of the "New Ivies" by Newsweek. In 2010, the Wall Street Journal ranked Carnegie Mellon 1st in computer science, 4th in finance, 10th overall, and 21st in engineering according to job recruiters. Carnegie Mellon University ranks thirteenth among "Best Colleges By Salary Potential (Bachelor's Only)" in the United States according to PayScale's 2016–17 study. In 2016, the Carnegie Mellon's Tepper School of Business placed 15th in an annual ranking of U.S. business schools by Bloomberg Businessweek. In 2016, The Hollywood Reporter ranked the School of Drama 3rd in the world among undergraduate drama schools. In 2015, the same publication ranked the MFA program at the School of Drama 5th in the world. In 2015, Carnegie Mellon University was ranked The Best Information Technology School in the United States. In addition to its Pittsburgh campus, Carnegie Mellon has a branch campus in the Middle East, Carnegie Mellon University in Qatar, which offers a full undergraduate curriculum with degree programs in computer science, business administration, biology, computational biology, and information systems. The campus is located in Doha's Education City which is home to multiple other U.S. universities all of which are funded by the Qatar Foundation. The Qatari campus has been the subject of criticism due to Qatar's adherence to Sharia Law and lack of freedom of speech and intellectual freedoms. Additionally, Carnegie Mellon and other U.S. Universities in Education City have been criticized for being essentially complicit in Qatar's funding of terrorist groups such as Al Qaeda, ISIS, and Hamas and their questionable human rights record by continuing to operate there despite these issues. It also has graduate-level extension campuses in Mountain View, California in the heart of Silicon Valley (offering masters programs in Software Engineering and Software Management). The Tepper School of Business maintains a satellite center in downtown Manhattan and the Heinz College maintains one in Adelaide, Australia. The Heinz College, the Institute for Politics and Strategy, and the Department of Engineering and Public Policy host centers in Washington, D.C. as part of degree programs, research, and government affairs initiatives as well as being a part of the University of California, Washington Center. Carnegie Mellon also established the Integrative Media Program at Steiner Studios in Brooklyn, New York. Carnegie Mellon also maintains the Carnegie Mellon Los Angeles Center in North Hollywood, California where students in the Master of Entertainment Industry Management program are required to relocate to Los Angeles in their second year and attend classes at this facility. The Carnegie Mellon University campus in Pittsburgh has served as the locale for many motion pictures. Alumnus George A. Romero filmed Creepshow (1982) in and around Margaret Morrison Carnegie Hall. 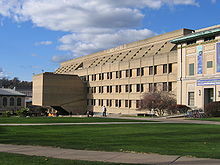 Much of the on-campus scenes in the 2000 film Wonder Boys, starring Michael Douglas and Tobey Maguire, were filmed in Carnegie Mellon's campus. Other movies filmed at Carnegie Mellon include The Mothman Prophecies, Dogma, Lorenzo's Oil, Hoffa, The Dark Knight Rises, and Flashdance. The university is also featured prominently in the films Smart People, Monkey Shines, and in the anime Summer Wars. It was also referenced on an episode of The Simpsons, Weeds, and in the television film Mean Girls 2. Carnegie Mellon was identified as the university "Rat" went to in the science fiction film The Core, as well as the university that one of the astronauts attended in the film Deep Impact. The 68th Tony Awards in 2014 announced Carnegie Mellon University as its first educational partner in jointly awarding the "Tony Honor for Excellence in Theatre Education", which will "honor kindergarten through high school (K-12) theatre educators". The College of Fine Arts is one of the oldest colleges of fine arts in the United States, and today it is a federation of five distinct schools: The School of Architecture, The School of Music, The School of Design, The School of Drama, and The School of Art. Unlike the other colleges at CMU, where switching between undergraduate programs within the student's currently enrolled college is relatively straightforward, switching to a different school within CFA often requires the student go through an application process similar to that of a High School student. The college shares research projects, interdisciplinary centers and educational programs with other units across the university. The College of Fine Arts runs masters programs in Arts Management and Entertainment Industry Management with the Heinz College, as well as interdisciplinary undergraduate programs partnered with Dietrich College of Humanities and Social Sciences (BHA), Mellon College of Science (BSA), and the School of Computer Science (SCS). The Dietrich College of Humanities and Social Sciences is the university's liberal and professional studies college and emphasizes the study of the human condition through rigorous analysis and technology. Departments include English, History, Modern Languages, Philosophy, Psychology, Social and Decision Sciences and Statistics as well as an Institute for Politics and Strategy. The college also offers undergraduate degree programs in Information Systems, Economics (the latter jointly with the Tepper School of Business), and the Bachelor of Humanities and Arts (BHA) with the College of Fine Arts. The H. John Heinz III College of Information Systems and Public Policy offers top-ranked master's degrees in Public Policy and Management, Health Care Policy and Management, Medical Management, Public Management, Information Systems and Management, Information Technology, and Information Security Policy and Management. 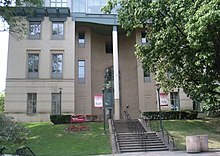 The Heinz College also runs masters programs in Arts Management and Entertainment Industry Management with the College of Fine Arts. It consists of the School of Information Systems & Management and the School of Public Policy & Management. It also offers several PhD and executive education programs. The Mellon College of Science includes four departments: Biological Sciences, Chemistry, Mathematical Sciences and Physics. In addition, the college is expanding efforts in green chemistry, bioinformatics, computational biology, nanotechnology, computational finance, cosmology, sensor research and biological physics. It also offers an undergraduate Bachelor of Science and Arts (BSA) degree in conjunction with the College of Fine Arts. The Gates Center at the university's computer science school. The School of Computer Science: Carnegie Mellon University helped define, and continually redefines, the field of computer science. The School of Computer Science is recognized internationally as one of the top schools for computer science. The School of Computer Science includes seven departments: the Computer Science Department, Computational Biology Department, Robotics Institute, Institute for Software Research, Human-Computer Interaction Institute, Language Technologies Institute, and the Machine Learning Department. It additionally offers the undergraduate Bachelor of Computer Science and Arts (BCSA) degree in conjunction with the College of Fine Arts. Carnegie Mellon also runs the Integrative Design, Arts, and Technology (IDeATe) Network to provide university-wide arts and technology education to students from every college. IDeATe allows students to take minors or concentrations in Animation and Special Effects, Entrepreneurship for Creative Industries, Game Design, Intelligent Environments, Learning Media, Media Design, Physical Computing, and Sound Design. IDeAte will also offer graduate master's degrees in Emerging Media, Game Design, Integrative Innovation for Products and Services, Computational Data Science, Urban Design, and Production Technology and Management. IDeATe also manages the Entertainment Technology Center (ETC) in conjunction with the School of Computer Science and the College of Fine Arts. Each master's degree program has an option to study in the CMU Integrative Media Program (IMP) at Steiner Studios in New York City. IDeATe Network will be based on the Pittsburgh campus upon the development of recently acquired property on Forbes Avenue west of Junction Hollow. Carnegie Mellon University Libraries include Hunt Library, the Roger Sorrells Engineering & Science Library, the Mellon Institute Library, the Posner Center, and the Qatar Library. Additionally, the Libraries' Million Book Project (2001–) sparked development of the Universal Digital Library. The University Libraries host a number of full text special collections for public access, including the Andrew Carnegie Collection, Herbert A. Simon Collection, Allen Newell Collection, the H. John Heinz III Collection, the Pittsburgh Jewish Newspapers Project, and the Posner Memorial Collection. Carnegie Mellon students and faculty have access to the Carnegie Library of Pittsburgh and some University of Pittsburgh libraries through consortial agreements with those institutions. The Hunt Institute for Botanical Documentation (HIBD), dedicated as the Rachel McMasters Miller Hunt Botanical Library in 1961, has been a research division of CMU started as an international bibliographical research and service in the fields of botany, horticulture and the history of the plant sciences, which has a significant research library and art holdings on the 5th floor of Hunt Library. The university's Software Engineering Institute also houses a research library. Alice (software) – freeware (for non-commercial purposes) object-based educational programming language with an integrated development environment (IDE). Andrew Project – distributed computing environment developed at Carnegie Mellon University beginning in 1982. It was an ambitious project for its time and resulted in an unprecedentedly vast and accessible university computing infrastructure. The goal was to have connected 3M computer workstations. Artificial intelligence – Several of the first AI software programs were created at Carnegie Mellon. These include the Logic Theorist, General Problem Solver, and Soar. Autonomous vehicle – Navlab, the first autonomous car program was developed by Carnegie Mellon. 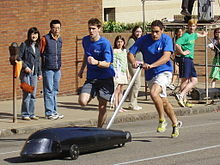 Since then, H1ghlander and Sandstorm autonomous vehicles were developed at Carnegie Mellon and placed 3rd and 2nd in the DARPA Grand Challenge and Carnegie Mellon's Boss won the DARPA Grand Challenge (2007). The university continues to be a leader in autonomous research and development. BLISS – system programming language developed at Carnegie Mellon University by W. A. Wulf, D. B. Russell, and A. N. Habermann around 1970. It was perhaps the best known systems programming language until C made its debut in 1972. 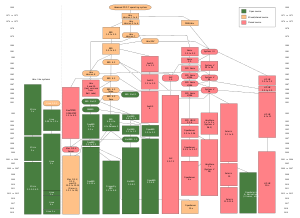 Mach (kernel) – Richard Rashid and Avie Tevanian developed Mach at Carnegie Mellon from 1985 to 1994, ending with Mach 3.0, which is a true microkernel. Mach was developed as a replacement for the kernel in the BSD version of Unix, so no new operating system would have to be designed around it. Experimental research on Mach appears to have ended, although Mach and its derivatives exist within a number of commercial operating systems. These include NeXTSTEP and OpenStep, upon which macOS and iOS are based. Wi-fi network – Alex Hills created the first wi-fi network using a local area network (LAN) on the Carnegie Mellon campus in 1993. Carnegie Mellon University's alumni and faculty have founded many companies, some of which are shown below. Adobe Systems, 1982, co-founder Charles Geschke (Ph.D.). Appaloosa Management, 1993, co-founder David Tepper (M.B.A). Red Hat, 1993, co-founder Marc Ewing (B.S). Sun Microsystems, 1982, co-founders Vinod Khosla (B.S) and Andy Bechtolsheim (M.S). BodyMedia, 1999, co-founder Astro Teller (Ph.D.). Cellomics, 1996, founder D. Lansing Taylor (Professor). Dansk International Designs, 1974, founder Ted Nierenberg (B.S). FORE Systems, 1990, founder Francois Bitz (Professor). Juniper Networks, 1996, founder Pradeep Sindhu (Ph.D.). DuoLingo, 2011, founders Luis von Ahn (Ph.D.) & Severin Hacker (Ph.D.). Lycos, 1994, founder Michael Loren Mauldin (Ph.D.). Vivisimo, 2000, co-founder Raul Valdes-Perez (Professor, Ph.D.). For the 2006 fiscal year, the university spent $315 million on research. The primary recipients of this funding were the School of Computer Science ($100.3 million), the Software Engineering Institute ($71.7 million), the College of Engineering ($48.5 million), and the Mellon College of Science ($47.7 million). The research money comes largely from federal sources, with a federal investment of $277.6 million. The federal agencies that invest the most money are the National Science Foundation and the Department of Defense, which contribute 26% and 23.4% of the total university research budget respectively. The recognition of Carnegie Mellon as one of the best research facilities in the nation has a long history—as early as the 1987 Federal budget CMU was ranked as third in the amount of research dollars with $41.5 million, with only MIT and Johns Hopkins receiving more research funds from the Department of Defense. The Language Technologies Institute (LTI) is another unit of the School of Computer Science and is famous for being one of the leading research centers in the area of language technologies. The primary research focus of the institute is on machine translation, speech recognition, speech synthesis, information retrieval, parsing and information extraction. Until 1996, the institute existed as the Center for Machine Translation that was established in 1986. From 1996 onwards, it started awarding graduate degrees and the name was changed to Language Technologies Institute. Carnegie Mellon has made a concerted effort to attract corporate research labs, offices, and partnerships to the Pittsburgh campus. Apple Inc., Intel, Google, Microsoft, Disney, Facebook, IBM, General Motors, Bombardier Inc., Yahoo!, Uber, Tata Consultancy Services, Ansys, Boeing, Robert Bosch GmbH, and the Rand Corporation have established a presence on or near campus. In collaboration with Intel, Carnegie Mellon has pioneered research into claytronics. There are more than 100,000 Carnegie Mellon alumni worldwide with the graduating class of 2015. Alumni and current/former faculty include 20 Nobel laureates, 5 Members of the National Academy of Medicine, 17 Members of the National Academy of Sciences, 57 Members of the National Academy of Engineering, 7 Packard Fellows, 124 Emmy Award recipients (including ten time recipient Steven Bochco), 10 Academy Award recipients, 47 Tony Award recipients, 2 winners of the Stockholm Prize in Criminology, and 13 Turing Award recipients. Famous alumni include artists Andy Warhol, Philip Pearlstein, John Currin, Shalom Neuman, Jonathan Borofsky and Burton Morris; Authors John-Michael Tebelak and Kurt Vonnegut; Screenwriter Michael Goldenberg, television series creator Steven Bochco, actors Matt Bomer and Zachary Quinto, Charles Geschke, Co-Founder and Chairman of Adobe Systems; Stephanie Kwolek, inventor of Kevlar; James Gosling, creator of the Java programming David Edward Byrd, Rock and Broadway Theater Poster Artist and graphic designer language; Andy Bechtolsheim, co-founder of Sun Microsystems; David Kelly, co-founder of IDEO; George Pake, founder of Xerox PARC; Marc Ewing, co-founder of Red Hat; Jim Levy, founding CEO of Activision; former General Motors CEO and Secretary of Defense, Charles Erwin Wilson; billionaire hedge fund investor and owner of the Carolina Panthers of the National Football League David Tepper; mountaineer and author Aron Ralston; Scott Fahlman, creator of the emoticon; Chris Messina, creator of the hashtag; and astronauts Edgar Mitchell (of Apollo 14) and Judith Resnik, who perished in the Space Shuttle Challenger disaster. John Forbes Nash, a 1948 graduate and winner of the 1994 Nobel Prize in Economics, was the subject of the book and subsequent film A Beautiful Mind. Alan Perlis, a 1943 graduate, was a pioneer in programming languages and recipient of the first ever Turing award. The Fence – In the early days of Carnegie Tech, there was a single bridge which connected Margaret Morrison Women's College with the Carnegie Institute of Technology. The bridge was a meeting place for students. In 1916, the bridge was taken down and the university filled in the area. The administration built a wooden fence as a new meeting place. The students did not understand why anyone would want to meet at a fence.The administration was about to give up and tear it down, but that night a fraternity, as a prank, painted the entire fence advertising a fraternity party. Ever since, painting the Fence has been a Carnegie Mellon tradition. 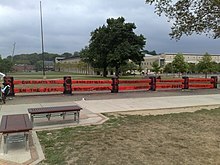 The Fence at Carnegie Mellon lies at the center of campus, in the area known as "the Cut". Students guard the fence 24 hours a day, and, as long as two vigils are maintained, no other student may "take" the fence. The fence can then be painted by the group that has it, but only between midnight and 6 am. Only hand brushes may be used; the use of spray paint or paint rollers is considered vandalism and results in a fine. The previous paint cannot be stripped, and each new painting adds a new layer. The original wooden fence finally collapsed in the 1990s due to the weight from over 1' of surrounding paint, and was immediately replaced with an identical one manufactured from concrete. Today the fence is considered "the world's most painted object," by the Guinness Book of World Records. The Kiltie Band- Carnegie Mellon's Kiltie Band, dressed in full Scottish regalia, including kilts and knee socks, performs during every home football game. Carnegie Mellon offers conventional housing for its students through single-gender, coeducational, and special interest options. Students can choose from a variety of housing options. The three options for first-year students are standard, prime, and apartment-style living. The Standard is a typical college dormitory setting, a long hallway with a series of double (two people to a room). Prime offers more privacy through suite-style rooms. Apartment-style living is available through the Residence on Fifth and Shirley apartments. Upperclassmen have additional options for housing, which include town houses and a larger variety of one or two bedroom apartments. There are 20 residential buildings on campus and five off campus in the Oakland area of Pittsburgh. The Greek tradition at Carnegie Mellon University began over 100 years ago with the founding of the first fraternity on campus, Theta Xi, in 1912. The Panhellenic sorority community was founded in 1945, by Chi Omega, Delta Delta Delta, Delta Gamma, Kappa Alpha Theta, and Kappa Kappa Gamma. The Chi Omega chapter at Carnegie Mellon transformed into an independent sorority, Zeta Psi Sigma, and has since become Alpha Chi Omega. The Alpha Phi chapter was created in April 2013. There is one Asian American interest sorority – alpha Kappa Delta Phi (colony), and one Asian American interest fraternity – Lambda Phi Epsilon. Currently, Carnegie Mellon University has thirteen active fraternities: Alpha Epsilon Pi, Alpha Phi Alpha, Alpha Tau Omega (colony), Alpha Sigma Phi, Delta Tau Delta, Kappa Sigma, Lambda Phi Epsilon, Phi Delta Theta, Pi Kappa Alpha, Sigma Alpha Epsilon, Sigma Chi, Sigma Nu, and Sigma Phi Epsilon. The Carnegie Mellon Tartans were a founding member of the University Athletic Association of NCAA Division III. Prior to World War II Carnegie Mellon (as Carnegie Tech) played with NCAA Division I teams. In 1936, the Carnegie Tech riflery team won the national intercollegiate championship. Currently, varsity teams are fielded in basketball, track, cross country, football, golf, soccer, swimming & diving, volleyball, tennis, hockey, and rowing. In addition, club teams exist in ultimate frisbee, rowing, rugby, lacrosse, hockey, baseball, softball, skiing & snowboarding, soccer, volleyball, water polo, and cycling. Carnegie Mellon Athletics runs a comprehensive and popular intramural system, maintains facilities (primarily Skibo Gymnasium, Cohon University Center, and Gesling Stadium), and offers courses to students in fitness and sports. Carnegie Mellon's primary athletic rivals are fellow UAA schools Case Western Reserve University and Washington University in St. Louis; the Tartans have an especially intense rivalry with the latter's football team. On November 28, 1926, the 6–2 Carnegie Technical Institute football team shut out the undefeated Notre Dame Fighting Irish 19–0 at Forbes Field. Knute Rockne, the coach of the Irish at the time, was so confident that the Irish would defeat "tiny Carnegie Tech" that he decided to skip the game and travel to Chicago to watch the Army-Navy football game for scouting purposes. It was only later that he found out by telegram that the Irish had suffered their first loss of the season. ESPN compared the upset to the Appalachian State victory over the University of Michigan in 2007. The game was ranked the fourth-greatest upset in college football history by ESPN. In recent years, the varsity track and cross country programs have seen outstanding success on the Division III national level. The men's cross country team has finished in the top 15 in the nation each of the last three years, and has boasted several individual All-Americans. The men's track team has also boasted several individual All-Americans spanning sprinting, distance, and field disciplines. Recent All-Americans from the track team are Tommy Vandenberg (2014–2015), Brian Harvey (2007–2009), Davey Quinn (2007), Nik Bonaddio (2004, 2005), Mark Davis (2004, 2005), Russel Verbofsky (2004, 2005) and Kiley Williams (2005). Carolyn Lowe (10,000 meters 1992) is the only track athlete to win a NCAA Division III championship. The Carnegie Mellon Cricket Club represents Carnegie Mellon in intercollegiate competitions. CMU cricket clubs are regular participants in the American College Cricket national championships. CMU were joint-runners up in the first-ever American College Cricket Tournament held in Florida in Spring 2009. In October 2017, Carnegie Mellon took part in a study conducted by the University of Pittsburgh’s Office of Child Development that examined food insecurity among students. The results from the CMU survey demonstrated that 19% of student respondents felt some sense of food insecurity, which is defined by the study as "a lack of consistent access to enough food for an active, healthy life." In an effort to address the need for food security, CMU opened the doors to a on-campus pantry on November 9, 2018. The pantry gives visitors the opportunity to pick up non-perishables and fresh produce for their household free of charge every two weeks. The pantry is accessible to all graduate and undergraduate CMU students, and is located in the Residence on Fifth dormitory in Oakland. ^ "CMU Fact Sheet" (PDF). cmu.edu. March 2018. Retrieved September 4, 2018. ^ a b c "College Navigator - Carnegie Mellon University". ed.gov. Retrieved September 4, 2018. ^ a b "About the Tepper School Carnegie Mellon Campus". Tepper School of Business. Retrieved February 15, 2017. ^ "2015–2016 Undergraduate Catalog: Department of Athletics and Physical Education". Carnegie Mellon University. Retrieved October 15, 2015. ^ "History - CMU - Carnegie Mellon University". Carnegie Mellon University. Retrieved September 4, 2018. ^ "Carnegie Mellon University's Global Presence". Carnegie Mellon University. Retrieved September 4, 2018. ^ "Academics - CMU - Carnegie Mellon University". Carnegie Mellon University. Retrieved September 4, 2018. ^ "Interdisciplinary Programs - CMU - Carnegie Mellon University". Carnegie Mellon University. Retrieved September 4, 2018. ^ "CMU Fact Sheet" (PDF). Carnegie Mellon University. March 2018. Retrieved September 4, 2018. ^ a b "Awards - CMU - Carnegie Mellon University". Carnegie Mellon University. Retrieved September 4, 2016. ^ Committee on Education, United States House of Prepresentatives (1920). Charges Against the Federal Board for Vocational Education, Volume 3. Washington: Government Printing Office. Retrieved June 25, 2015. ^ "Boston Evening Transcript – Google News Archive Search". google.com. ^ "History of MMCC". carnegiemellontoday.com. Archived from the original on February 21, 2009. Retrieved February 15, 2008. 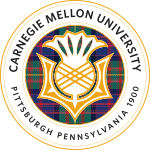 ^ "CMU closing its Carnegie Mellon Research Institute". post-gazette.com. Retrieved October 1, 2013. ^ "CMU student center to be renamed for Cohon". Pittsburgh Post-Gazette. 2014. Retrieved March 25, 2014. ^ "The Tartan reflects on the people and events of 2005–2006". The Tartan. 2006. Retrieved January 7, 2009. ^ "CMU proposes hotel, office, retail complex to help remake Forbes Avenue". The Pittsburgh Post-Gazette. 2015. Retrieved April 23, 2015. ^ "Randy Pausch's Last Lecture: Really Achieving Your Childhood Dreams" (PDF). Randy Pausch. Retrieved May 7, 2008. ^ QS World University Rankings – 2012. Top Universities (December 19, 2012). Retrieved on July 17, 2013. ^ "The Top 200 World Universities". timeshighereducation.com. Retrieved February 18, 2008. ^ Inspire Innovation: About the Campaign – Carnegie Mellon Web Site.. Retrieved September 11, 2011. ^ "Retrieved September 20, 2012". Cmu.edu. Retrieved June 19, 2014. ^ "Heinz Endowments Gift". Carnegie Mellon University. Retrieved December 12, 2013. ^ "Retrieved November 15, 2013". Cmu.edu. November 14, 2013. Retrieved June 19, 2014. ^ "Retrieved August 25, 2015". Cmu.edu. August 25, 2015. Retrieved August 25, 2015. ^ "Retrieved February 5, 2013". Cmu.edu. February 5, 2013. Retrieved June 19, 2014. ^ "Suresh To Step Down as President of Carnegie Mellon University - News - Carnegie Mellon University". Carnegie Mellon University. June 1, 2017. Retrieved September 4, 2018. ^ "Farnam Jahanian Named President of Carnegie Mellon University - News - Carnegie Mellon University". Carnegie Mellon University. March 8, 2018. Retrieved September 4, 2018. ^ "Peer institutions of Carnegie Mellon University". cmu.edu. Retrieved March 28, 2009. ^ a b "Undergraduate Admissions Statistics 2018–19" (PDF). Carnegie Mellon Undergraduate Admissions. Retrieved January 8, 2019. ^ a b "Admission Costs". Carnegie Mellon University. Retrieved December 26, 2015. ^ "Top-Ranked Universities That Grant the Most STEM Degrees". U.S. News and World Report. Retrieved June 18, 2013. ^ a b c "Carnegie Mellon University: Best Colleges Rankings". U.S. News & World Report. Retrieved September 16, 2016. ^ "U.S. News Best Grad School Rankings". U.S. News & World Report. Retrieved March 14, 2017. ^ "Americas 25 New Elite Ivies". newsweek.com. Retrieved August 21, 2010. ^ "The Top 25 Recruiter Picks". Wall Street Journal. September 13, 2010. ^ "Best Universities and Colleges | Payscale". www.payscale.com. Retrieved December 20, 2016. ^ "These Are The Best Graduate Business Schools of 2016". Bloomberg.com. Retrieved December 20, 2016. ^ "The 25 Best Drama Schools in 2016". The Hollywood Reporter. Retrieved June 2, 2014. ^ "The 25 Best Drama Schools for a Master of Fine Arts". The Hollywood Reporter. Retrieved May 29, 2015. ^ "Carnegie Mellon University – Computer Ranking 2015". Retrieved October 20, 2016. ^ a b "In Qatar's Education City, U.S. colleges are building an academic oasis". ^ Stoltzfus, Justin. "Advocate questions motive behind Qatar's financial ties to U.S. colleges". Gulf News Journal. ^ "While U.S. universities see dollar signs in Qatari partnerships, some cry foul". Gulf News Journal. ^ "Hate Preachers on Qatar Campus: Obama Gives Qatar Undeserved A+ on Fighting Incitement". The Huffington Post. April 29, 2016. ^ "Alumnus Gets Star Treatment | Carnegie Mellon Today". cmtoday.cmu.edu. Retrieved January 23, 2017. ^ "Major Motion Picture, "Smart People," To Be Filmed on Campus". www.cmu.edu. Retrieved January 23, 2017. ^ "Carnegie Mellon on "The Simpsons" and "Lie to Me"- Carnegie Mellon University". Cmu.edu. February 16, 2009. Archived from the original on January 14, 2010. Retrieved February 22, 2010. ^ Holahan, Jane (December 7, 2006). "Creator on 'Pippin:' 'It was an inventive time'". Lancaster Online. Archived from the original on September 12, 2007. Retrieved December 30, 2006. ^ Couric, Katie (April 30, 2009). "Randy Pausch – The 2008 TIME 100". TIME. Retrieved February 22, 2010. ^ "TRANSFER STUDENTS". Undergraduate Admission Requirements. School of Drama. July 31, 2016. Archived from the original on February 8, 2011. ^ "REGULAR DECISION & TRANSFER". Undergraduate Admissions. School of Architecture. July 31, 2016. ^ "Transfer Applications". Application Instructions & Timeline. School of Design. July 31, 2016. ^ "BXA Intercollege Degree Programs". CMU College of Fine Arts. July 31, 2016. ^ "BXA Intercollege Degree Programs – The Programs". www.cmu.edu. Retrieved February 7, 2018. ^ "BXA Intercollege Degree Programs – BHA Program". www.cmu.edu. Retrieved February 7, 2018. ^ "BXA Intercollege Degree Programs – BSA Program". www.cmu.edu. Retrieved February 7, 2018. ^ "America's Best Graduate Schools 2009". U.S. News & World Report. Retrieved March 28, 2008. ^ "BXA Intercollege Degree Programs – BCSA Program". www.cmu.edu. Retrieved February 7, 2018. ^ "UBA Curriculum Change". Carnegie Mellon University. Archived from the original on September 25, 2015. ^ "Integrative Design, Arts, and Technology". Carnegie Mellon University. Retrieved January 17, 2014. ^ "Home : Hunt Institute". Hunt Institute for Botanical Documentation. Archived from the original on May 9, 2008. Retrieved May 21, 2018. ^ "Middle States Accreditation – Carnegie Mellon University". Carnegie Mellon University. Retrieved January 26, 2013. ^ Schackner, Bill; Chute, Eleanor (March 29, 2012). "Pitt, CMU make most of proximity". Pittsburgh Post-Gazette. Pittsburgh, PA. Retrieved May 21, 2012. ^ University of Pittsburgh: Undergraduate Admissions & Financial Aid Archived January 19, 2012, at the Wayback Machine. Pitt.edu. Retrieved on July 17, 2013. ^ "Welcome". Pittsburgh Science of Learning Center. Retrieved December 2, 2011. ^ "Three Pittsburgh institutions. One goal". Pittsburgh Health Data Alliance. Retrieved March 16, 2015. ^ "Carnegie Mellon University – University Discoveries". ^ McKusick, Marshall Kirk; Bostic, Keith; Karels, Michael J.; Quarterman, John S. (April 30, 1996). The Design and Implementation of the 4.4 BSD Operating System. Addison-Wesley. p. 123. ISBN 978-0-7686-8494-0. ^ "How Wi-Fi got its start on the campus of CMU, a true story". Archived from the original on December 2, 2016. Retrieved October 25, 2016. ^ University, Carnegie Mellon. "Alex Hills-Engineering and Public Policy – Carnegie Mellon University". ^ University, Carnegie Mellon. "Affiliated Companies-Corporate and Institutional Partnerships – Carnegie Mellon University". www.cmu.edu. Retrieved November 25, 2017. ^ "CMU Is Third in Defense Contracts". Pittsburgh Post-Gazette. May 25, 1988 – via Google News Archive. ^ "PITTSBURGH SUPERCOMPUTING CENTER". Pittsburgh Supercomputing Center. Retrieved February 18, 2008. 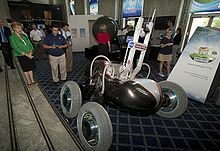 ^ "Carnegie Mellon Lunar Rover Wows XPRIZE Judges, Wins First Milestone Prize for Development Toward Flight Readiness – Carnegie Mellon School of Computer Science". Retrieved October 20, 2016. ^ "Robotics Institute". Robotics Institute. Retrieved February 18, 2008. ^ Paulk, Mark C.; Weber, Charles V; Curtis, Bill; Chrissis, Mary Beth (February 1993). "Capability Maturity Model for Software (Version 1.1)" (PDF). Technical Report. Software Engineering Institute, Carnegie Mellon University. CMU/SEI-93-TR-024 ESC-TR-93-177. ^ Paulk, Mark C.; Weber, Charles V; Curtis, Bill; Chrissis, Mary Beth (1995). The Capability Maturity Model: Guidelines for Improving the Software Process. SEI series in software engineering. Addison-Wesley. ISBN 0-201-54664-7. ^ "Software Engineering Institute". sei.cmu.edu. Retrieved February 16, 2008. ^ "Welcome to the Human-Computer Interaction Institute". Human-Computer Interaction Institute. Retrieved February 18, 2008. ^ "CMU/Language Technologies Institute". Language Technologies Institute. Retrieved December 24, 2008. ^ "The Claytronics Project – Collaborative Research in Programmable Matter Directed by Carnegie Mellon and Intel". Cs.cmu.edu. February 20, 2007. Retrieved June 19, 2014. ^ "We Are 100K Strong!". Retrieved December 31, 2015. ^ "Carnegie Museum of Art". collection.cmoa.org. Archived from the original on November 7, 2017. Retrieved August 26, 2018. ^ "John Currin at Gagosian". www.gagosian.com. ^ Higgins, Tim. "New York 'Fusion' artist Shalom Neuman brings philosophy to Easton". ^ "Jonathan Borofsky Interview – Carnegie Mellon Today". cmtoday.cmu.edu. ^ "Burton Morris: The King of Pop Art Hits the "Red Carpet"". Retrieved February 13, 2013. ^ "Notable Alumni". Retrieved November 19, 2015. ^ "Judy Resnik : Family, Friends Remember Engineer Who Reached for the Stars". Archived from the original on January 31, 2016. Retrieved February 7, 2016. ^ "Walking Tour". cmu.edu. Retrieved February 18, 2008. ^ a b "CMU Housing". Carnegie Mellon University. Archived from the original on July 24, 2011. Retrieved July 26, 2011. ^ "Intercollegiate rifle team trophy" (PDF). Retrieved September 5, 2009. ^ "Carnegie Mellon Ultimate Club". cmu.edu. Retrieved February 18, 2008. ^ "Tartan Crew". tartancrew.org. Retrieved February 18, 2008. ^ "CMU Ice Hockey Club". Archived from the original on February 1, 2011. Retrieved February 18, 2008. ^ "Join the Baseball Club". cmu.edu. Retrieved February 18, 2008. ^ "Club Sports – Carnegie Mellon University Athletics". Athletics.cmu.edu. Retrieved June 19, 2014. ^ "CMUWP". cmuwp. Archived from the original on June 26, 2009. Retrieved August 25, 2009. ^ "Carnegie Mellon Cycling Club". cmu.edu. Archived from the original on September 5, 2008. Retrieved February 18, 2008. ^ "Tech's Greatest Victory". carnegiemellontoday.com. Archived from the original on March 17, 2008. Retrieved February 18, 2008. ^ "Upset special: With Rockne gone, Irish took a Michigan-like tumble". sports.espn.go.com. Retrieved February 18, 2008. ^ Wellsville Central Schools – Scrapbook Archived September 29, 2011, at the Wayback Machine. Wellsville.wnyric.org (August 30, 2012). Retrieved on July 17, 2013. ^ "About". CMU Cricket. Archived from the original on December 12, 2010. Retrieved June 19, 2014. ^ University, Carnegie Mellon (November 8, 2018). "Open for Business: CMU Pantry aims to reduce student food insecurity on campus - Student Government - Carnegie Mellon University". www.cmu.edu. Retrieved February 11, 2019. Wikimedia Commons has media related to Carnegie Mellon University.